Judge Randy Bellows of the Fairfax County Circuit Court has set April 25 – June 14, 2011 as the dates for the trial of the litigation between The Episcopal Church (TEC) and the Diocese of Virginia and nine churches who voted to separate from the Diocese of Virginia and join the Convocation of Anglicans North America (now affiliated with the Anglican Church in North America) in 2006. In addition, Judge Bellows ruled that it would be a bench trial instead of a jury trial asked by the Virginia congregations. Judge Bellows also ruled against the proposal by the Diocese and TEC to split the trial into multiple sections where the churches would be addressed together as a group and then separated church by church. In addition, Judge Bellows ruled that Church of Our Saviour Oatlands would not be separated from the other Virginia congregations but would be part of the April-June trial. Church of Our Saviour had not sought a jury trial. The form the trial will take will begin with The Episcopal Church and the Diocese of Virginia presenting their case, followed by the Virginia congregation responding and presenting their counter case, followed by TEC and the Diocese presenting their rebuttal and opposing the counter suit, followed by the Virginia congregations presenting their rebuttal as well as their rebuttal to the opposition of their counter suit. It sounded as though final arguments may be presented by brief. Judge Bellows then would rule on the entire case perhaps some time in June. There were several things that struck me about the court hearing last Friday. First of all, I have never seen the Episcopal Presiding Bishop’s personal chancellor David Booth Beers speak or smile to anyone in the Virginia congregations in all the times we have gathered together. But this Friday he was sitting next to the Diocese of Virginia’s Chancellor Russ Palmore and at one point, noticed that Bishop David Bena, CANA Suffragan Bishop for the Anglican District of Virginia and former Suffragan Bishop of the Episcopal Diocese of Albany, had come into the court room. Before the hearing began, David Booth Beers got up from his front row seat and walked over to the opposite side of the court room and to the back and warmly greeted Bishop Bena. Bishop Bena returned the warm greeting. I later learned that back in the early days of Bishop Bena’s ministry he was in the Military Chaplain’s office at 815 and got to know David Booth Beers who even then was the chancellor. Similar types of outreach happened following the hearing when attorneys from the Diocese of Virginia greeted the CANA attorneys, exchanging pleasantries beyond the casual nod. This was a marked change even from the last hearing when there were some barbs exchanged during and after the proceedings. Another highlight – possibly because Judge Bellows said it more than once – was that he announced that he was going to proceed through the preparations for the trial and during the trial itself “in good faith,”and urged the parties to do as well. It was a rather interesting phrase considering who is populating his court room. He repeated this more than once – that he would assume that all the parties were operating in good faith and not seeking to undermine the other, but assume the best of one another. He said he would continue to assume that all the parties were operating in good faith with each other until he saw differently, in which case he would intervene. It came across to me that he was saying – quite strongly in fact – that counsel from both sides should follow his direction and assume that all were operating in good faith. One might think at first that such a view would be naive, until you pause a moment and realize that if he is led to think differently, he has the authority to take this case in any direction he deems fit. He has the authority, in his way, to basically direct the parties now to operate in good faith. If they don’t, it will be at their own peril. Since he repeated himself on this particular point – holding back from stipulating certain rulings on the assumption that the parties would operate in good faith with each other – it seemed to drive home to me the point that it was as though he was chastening both parties that this is how he was going to operate and they would be wise to do the same. Webster Dictionary defines bona fides as “evidence of one’s good faith or genuineness.” What this says to me is that it’s not just what is presented in court, but how it is presented. And if we are able to restore this view – that all parties are operating in good faith – could that not bring us back to the table to find common ground resolution that would build us all up for mission as members of the same faith family? After all this time – as we see here at the Cafe from time to time – good faith has taken a hard hit over the years. One could point to reasons why this may be, but as Judge Bellows said – at this point, right now, right where we stand can we pledge to operate in good faith, seeing as marks of that trust evidence of genuineness and honesty? How would such a thing happen? The reality seems so far away, as the comments on the earlier post and other sites that have picked up that post reveal. I know of only one way – and that it to reorient ourselves to a new disposition, one that comes to us in who’s name we carry. This can’t be done by will power alone, the wounds go deep and even the bravest among us would be challenged to have such a will. It is interesting to think about how God operates in good faith, even knowing who he is dealing with. Even the famous words of John come to mind, “For God so loved the world that he gave his only begotten son …” It wasn’t that we deserved it or had earned the right to have a savior, not by a long shot. But it was because he loved us that he found a way to bring resolution between himself and the world – he took the initiative. Our response is as John writes, “that whosoever believes in him …” Do we dare to believe? Where do we begin? Perhaps with the one who is the most genuine and honest, who Paul describes so well in the 13th chapter of his first letter to the Corinthians. Oh that we may love one another like that. Perhaps this Christmas may open our minds and hearts in ways we never could have imagined. May it be so. Why is TEC going first? Normally, the party that files a lawsuit, thereby initiating litigation and dragging the defendant into court, gets to go first. I don't understand why TEC is going first. Help me out here. I believe TEC and the Diocese of Virginia *are* the parties that filed suit, so (as you state is the norm) they are the ones to present their arguments first. I know there is a thin line between sarcasm and satire – satire illumines, while sarcasm casts an non-indemnified shadow. It would be helpful I think if we left the sarcasm, i.e., the snark stuff, in the car, okay? That being said, I do believe SIFC was making the same point as Lurker – that in this case, TEC/DoV sued first and therefore goes first in court. BB, thanks so much for this very well done report. I feel like I was there even though I wasn't able to attend this time. You have a great way of getting at the essence of the story, and I agree with you. The tone now is quite different and welcomed. Blessings on everyone who participates in this blog for the Holiday Season. May the grace of our Lord be the light you follow. Thanks for this post. Clear and bright and very YOU. Don't agree with it all, but so what? As always, with great respect. 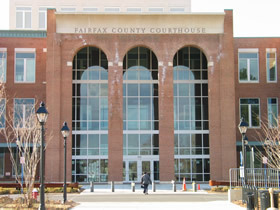 Within days of the December 2006 votes to depart the Diocese of Virginia, at least one of the departing groups filed actions in the Virginia courts to claim title to one of the historic properties (The Falls Church) that had been part of the Episcopal Diocese of Virginia. Other parishes in the diocese followed closely on the heels of the departees at the Falls Church. This was in mid-December 2006. The Diocese opposed this change of title and intervened (mid-January 2007) as a defendant in that suit. Shortly after that (late January 2007), the Diocese filed its own action that recited that the departees continued to occupy the premises, seeking a declaration, among other things, that the departing groups were liable for trespass, conversion, and alienation of the property. The action also seeks an accounting of all the real and personal property that the departing parishioners have used since December 2006. Although defendants in the first action, the Diocese (and the national Church) were plaintiffs in this latter action. The CANA affiliated groups eventually answered (after attempting to demeure) this suit and counterclaimed against the Diocese and the national Church. The first action is essentially over, given the disposition of the Virginia Supreme Court disapplying (if there is such a word) the very odd “Division Statute” upon which the CANA suit was based. CANA lost. What is left is the Declaratory Judgement suit in which the Diocese is a plaintiff, but in which the CANA factions have counter-sued. In short, there's enough litigation to last us a good long while, but my own view is that it has gone on too long already. amiss, reform it. Where it is right, strengthen it; where it is in want, provide for it; where it is divided, reunite it; for the sake of Jesus Christ thy Son our Savior. Amen. Lord, protect all of us and help us to forgive each other. Let Your will flow around, in and through us. Help us when we fall and fail. Help us to see You in each face we encounter. May we be You to each other as You were and are to us. Amen. BB – I confess that my frustration gets the best of me at times, as does my other half. I think as Christians we should be able to come up with solutions so that both sides can depart on their own ways. My frustration comes out when I see the one-sidedness of the other side – the being inclusive yet exclusive. There's room for everyone except for those wanting to practice the faith as received. And seem to delight in wanting to remove us from the earth. We L2 are personally willing to part ways with TEC without anything as others in our diocese have done. We know that time of leaving TEC in our “conservative” diocese of Central Florida will probably come. What are we both willing to give up? Everything. A building is temporary, like the temple that was torn down and no stone left on another. Some of those stones are in the Roman Colluseum, yes? Chalices, vestments, etc., are nice, but will never replace the Rock they are used to glorify. We've had Communion without all the trappings. We've worshipped in services in non-church settings. The Holy Spirit was there just as much as in an old, dignified building. Where is your heart? Take the buildings, but in your taking them if you hurt others, what have you gained? I say this for every side. I read Anon's comments about retaking the building for around 100 people. What of the others? The others that wanted to continue to worship as they had? What about them, too? Where is the concern for them – that is Christ. Just as much for the 100, for Scout. Those that remain just because of the building? If the building means more to them than you, me, or their fellow brothers and sisters in Christ – they have their reward, here, now. We would rather they take it and be done with it. Those that follow a building? But will it stop there? Or do the litigation and the harsh words continue because of those who have left because they do not choose to follow a different path than they learned? That is the cause of our frustration. The Spongs, Pikes, Melynyks. Deviators from God's Word without challenge. There is not concern or enough of it from those who chose to remain in TEC, but a building is far more important. This we do not understand. LL2, “the others” definitely didn't want to continue to worship as they had. They wanted to leave. I reckon if they had just left, no harsh words would have followed them, and it is absolutely certain that there would have been no litigation. Your post seem very angry to me, maybe not in the rage sort of way, but in the cynic or sarcasm sort of way. Nothing to due with your position on this matter, Mark Harris may share similar view to you (I do not know for sure, just a guess), but seems less tight up about matters. Prayers that you know the peace the surpasses understanding, so no matter how things turn out, you are at rest, but the Lord channels this energy for the good of all. I'm not sure why you would detect that, Kevin. Steven didn't understand the plaintiff/defendant designations and admitted to inquiring out of “snark.” I tried to help him out, thinking that things are complicated enough that, snark or no snark, it is possible for people to be confused about the sequence of the litigation. Rest assured, that I am not “angry” (or “very angry”) either by natural disposition or on this particular issue. In some ways, getting kicked out of a place of worship that I have loved for twenty years has been a blessing. I have found a more profound fellowship and meaning in worship by being with others in exile than I could in what had become a kind of mega-church. I have come to appreciate more what the early Pauline church must have been like when we had to worship in peoples' homes prior to finding temporary quarters donated by lovely Christians from another denomination. All this has improved me and the quality of my worship. I am grateful for it. What may come through (and that you mistake for anger) is that I am profoundly disappointed in the arrogance and pride of those who so comfortably assumed that their decision to leave carried with it the right to dispossess those who chose to stay. I consider that decision and attitude a huge and readily avoidable wrong that has caused much damage to all, including to the advancement of the Great Commission. Human history is studded with this kind of blindness and injustice. We are required to resist it when we see it. I think I do so cheerfully and politely, but, as I keep repeating to no substantive response, I have yet to hear enunciated a moral or ethical principle (or article of church governance) that says that when an individual or even a group leaves a church, particularly one organized along the lines of the Church of England or its American offshoot, he or they get to take things large or small from those who, for whatever reason, choose not to leave. All that those who left had to do was walk out the door. They would have been respected, honored, and their resources for mission would have been preserved. I could be in error, the trouble with the Internet is lack of lack of all the other ques. Scout – I think you and I and a few others should come up with 200K or so and pay some others to join us as parishioners at the Falls Church and after a reasonable wait declare we are leaving and that the church and its property belong to us – I wonder if we could get away with it? I wonder whether the present group who did the same seriously believe they truly own the church or realize their deception has been seen through? Scout -Your opinions, of course. What I fail to understand is how you feel that way about those who choose to stay the course, not to follow TEC in it's new course – yet how you feel is similar. All of this makes me shake my head as I'm praying for people who are having serious health issues, facing death, and some who have just died. All of this is petty to the real issues of life. The numbers of people leaving speak loudly. I have more pressing things to deal with. My prayers continue for all. God be with all. Merry Christmas! Thank You, Father, for the Gift of Your Son. May we all learn to please You in all that we do, just as Jesus did. Amen. Scout — I will have to apologize as my satire (or sarcasm as BB calls it–perhaps she is right) has misled some on this thread. I am quite familiar with the proceedings. I am poking fun at the fact that TEC/DoV have claimed that their lawsuits are defensive actions because the CANA parishes “filed lawsuits first,” or something like that, when in fact those “lawsuits” were the 57-9 petitions to local courts reporting the CANA parishes' votes, which TEC and DoV consented to in the Standstill Agreement. The Standstill Agreement was a document that TEC/DoV and the CANA parishes agreed to, which had the purpose of avoiding litigation so that the parties could try to negotiate to reach a settlement. TEC/DoV walked away from that document and filed their lawsuits. I still have not found someone to explain to me how one person can consent to action taken by another person in a written agreement, and then turn around and claim that the action is some injurious or hostile act. Right — they weren't REAL lawsuits. They didn't REALLY want the courts to order them title and control of the property, as the petitions and their lawyers asked. The past several years of litigation about 57-9 were just a practical joke, right? Allow me to do that, as I've done before. (But of course you and BB have no interest in the explanation. You prefer to spout inaccurate spin.) All that the Standstill Agreement says is that the parties agree that filing the 57-9 lawsuits was not a violation of the Standstill Agreement. The text of the agreement shows that they were lawsuits (because otherwise no exception would be needed), and that provision does nothing at all to negate the facts that the CANA folks spent years scheming to take the property (while the Diocese fully respected and accommodated their dissenting views), ultimately culminating in the first legal salvo — the lawsuits filed by the CANA folks. So what is next – how do we all become part of a solution? We are seeing evidence all ready that we may be able to share some ministries (Five Talents, Shrine Mont, LAMB Center, etc) – is that a first step? The First step is for everyone to take a blog-fast for the next several days and contemplate the continuing significance of Christmas. Happy Christmas, everyone. Am in 100% agreement with Scout. Let's celebrate and concentrate on the Wonderful Gift of Christ. a. will seek in good faith to negotiate with each other an amicable resolution of their differences concerning the property and clergy status. It's ironic that we're talking about this in a posting titled “In Good Faith.” At the very least, a showing of good faith would require the Diocese to come to terms honestly with the fact that it consented to the petitions in a document that expressly contemplated good faith negotiations from both sides, that the Diocese never even met to negotiate, that the Diocese let the agreement expire and immediately filed lawsuits, and now the Diocese couches its lawsuits as defensive actions. Again, why would someone sign an agreement expressly to negotiate, and then walk away? Steven, interesting that you've abandoned your original, erroneous argument about the Standstill Agreement and now moved on to a new one, with a new sarcastic question. Perhaps one might sign an agreement to negotiate, realize that the other side was holding a gun to your head and not inclined to accept any answer but the one they wanted, decide that the agreement no longer served a useful purpose, and let it expire according to its terms. Okay friends, can we please please watch the rhetoric? Again I ask you to imagine the person you are addressing as if they are sitting right across from you, pouring you some coffee into your cup and listening to you. This is a cafe, not a courtroom. Okay?